When I wrote this in an earlier post: “When I go into a store here in Sweden and look for tablets that is not the iPad, I only see Samsung tablets. Nothing else. Why is that? Is it only because Samsung is so dominant on the Android market? Or is it something more than that? Samsung will apparently be even more dominant, their goal for next year is to ship 100 million tablets,” I was apparently quite right. 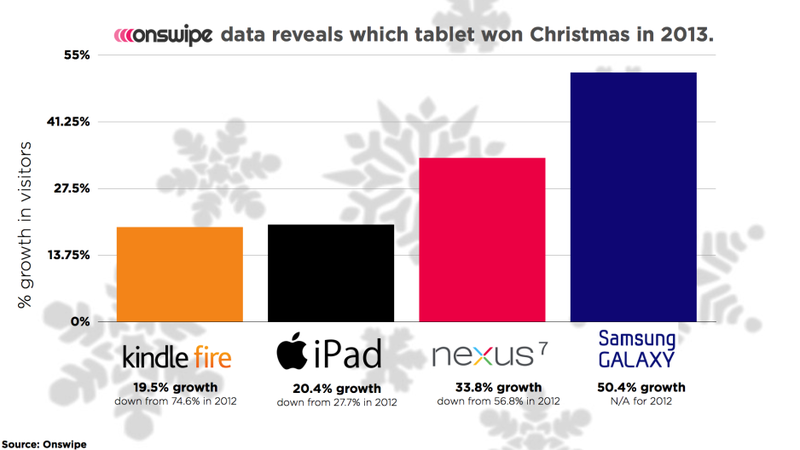 New statistics from the web company Onswipe show that Samsung tablet usage climbed over the holidays, it grew with more than 50% from Christmas 2012 to Christmas 2013, while iPad users with 20.4%, and Nexus 7 users grew with 33.8%. So it looks like Samsung is trying to dominate the tablet market by putting out more and more tablet models to get as many users as possible using them.